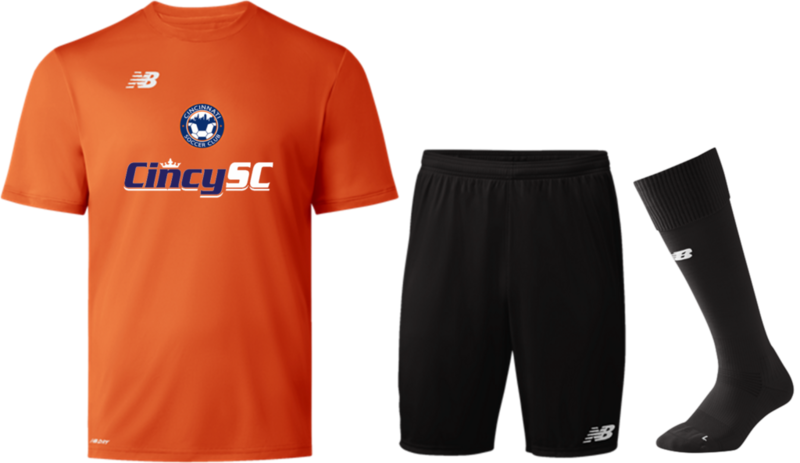 A player’s training kit consists of an orange top, black shorts, and black socks, and it’s included in your fees. 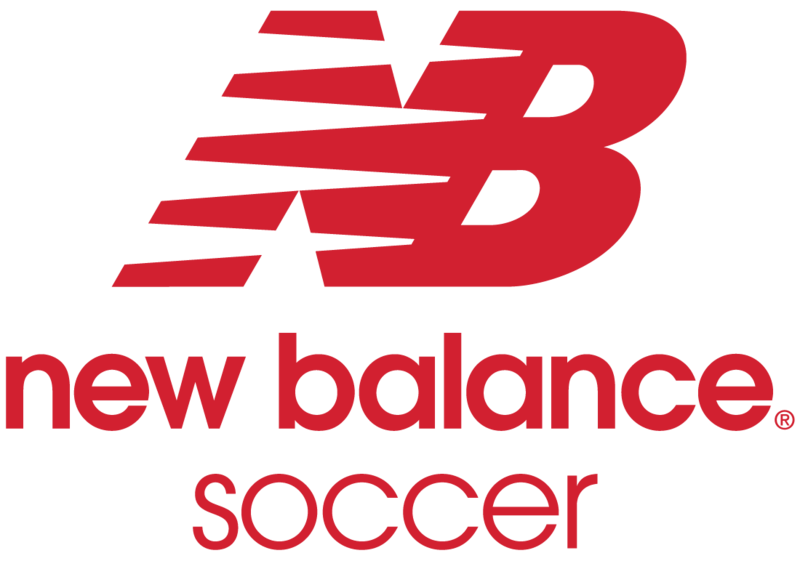 We think players are going to be excited that we’ve upgraded our training kit this year – it’s all New Balance! We’ve also ordered extras to make size exchanges easy and so that you can purchase additional sets if you want ($58 for a set, individual items also available, and also available online). During training camp and during the year, we wear the orange top at the beginning and end of the week, and the navy tryout t-shirt for the training session in the middle of the week in order to give you a break on the laundry. Players can also wear training kit from past years and we’re not particular about the brand of black shorts and socks a player wears. We plan to give out new game uniforms on or around Aug. 15. However, we are at the mercy of our suppliers (New Balance for the branded but un-numbered jerseys and shorts and Gazelle for the jersey numbering) to meet that date. Our game shorts and socks are not numbered, and just like training kit we’ll have extra available for exchange or purchase ($32 shorts, $12 socks). Our game shorts and socks are both navy and are the same as last year’s. We don’t have a 2nd color of shorts or socks because we think it makes packing and getting dressed for games more complicated and it’s not really necessary to have an alternate color. For our new 2018 white “hoop” jerseys, we’ll need to collect the size and number for each player. Request your new white “hoop” jersey size and number. You don’t need to do this right away, but we’d like to have all the requests by Aug. 1. These normally can’t be exchanged and players should expect to wear them for two years. For sizing, we had jerseys available to try on at our Meet the Club event, and we’ll continue to have them at SNP. You can also check this online sizing chart. Many girls have trouble deciding between the youth jerseys and the women’s jerseys. We took women’s jerseys (white and orange striped) and laid them over top of similarly-sized youth jerseys (navy). The WXS and WS are laid over top of a YL and the WM is over top of a YXL. As you can see, the sleeves in the women’s are shorter and the body has a curve vs. the boxier cut of the youth. Lengths are about almost the same, with the women’s slightly longer. This year there are two versions “last year’s jersey” that teams could use as their alternate jersey. Teams voted, and each team’s alternate jersey for 2018/19 is listed on the team list, in some club news emails, and at the bottom of this post. 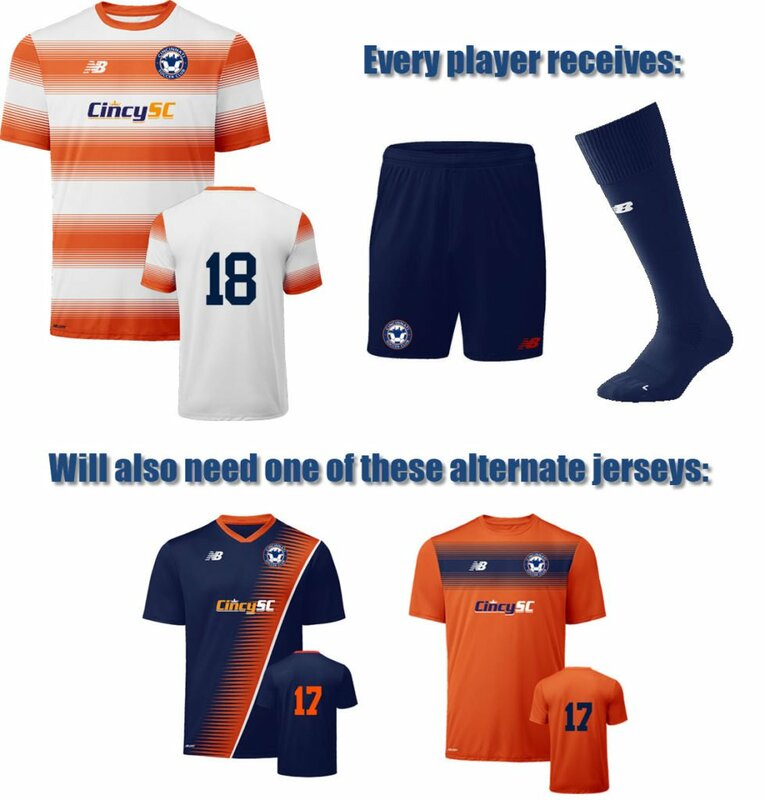 We urge all returning players to help a teammate and be a “jersey donor” – please return any jerseys you no longer need, including the other color, or any that are too small, so that we can donate them to new club members, use them to fix size issues and number conflicts, or use them for guest players. You can bring them to SNP or any other event, drop them off to me in Mariemont or Russell in Anderson, or figure something else out. If you are friends with a player that is no longer with the club, please politely ask if you can have theirs too. New players have the option of buying the navy alternate jersey online, or requesting a “game-worn” donated jersey. Obviously, we are dependent on donations in order to fulfill requests for game-worn jerseys. Before buying a new jersey online, please make sure you know are certain about your number assignment. What is the alternate jersey color for B02? Orange or Blue? I know you were concerned about the time it takes to get a new jersey. The reason there can be a long lead time is that it takes 45 days for New Balance to produce an unnumbered jersey. Getting a number put on (by our retailer, Gazelle), can happen in just a few days. We have a good inventory of jerseys so it shouldn’t take long to get an orange or navy jersey, if you want to order one.